Around the world today we find several ways of belonging, of which full conversion is one option. Entire communities see themselves as Jewish without being formally recognized as such. The two books under review both concern Jewish identity. The first examines the issue of conversion in Israel; the second discusses the self-perception the millions of people around the world who identify as Jews, irrespective of any conversion to Judaism or formal acknowledgement by the organized Jewish community in Israel or abroad. In Israel, the issue of conversion of non-Jewish immigrants (olim) from the former Soviet Union (FSU) is passionately debated. One example: an immigrant soldier with a Jewish father, who lost his life in one of Israel’s wars but will not be buried according to Halakha (Jewish religious law) in a Jewish military cemetery because his mother is not Jewish. Non-Jewish immigrants to Israel from the former Soviet Union (FSU) brought with them a range of cultural and religious identities. Many, as “Jews,” faced persecution and marginalization during the Communist era; but in Israel, they are not considered Jews. Israel’s Law of Return grants the non-Jewish partners, children and grandchildren of Jews the right to immigrate to Israel and to become Israeli citizens. It further grants converts from the Reform and Conservative movements the right to become Israeli citizens; however, the official rabbinate does not recognize them as Jews. As a rule, Israel’s Orthodox-controlled religious authorities only recognize as Jewish individuals born a Jewish mother or who have undertaken an Orthodox conversion process. Immigrants who do not meet the first condition, but wish to be recognized as Jews in Israel must undergo a conversion process. Over the last two decades, the State has established a network of conversion schools, designed to facilitate the conversion process and ease full integration into mainstream Jewish Israeli society. These schools, and the principles they represent, have been sharply criticized by a number of ultra-Orthodox leaders such as the late Rabbi Yosef Shalom Elyashiv. These arrangements have also been criticized by secular Jewish leaders who accept non-Jewish FSU immigrants as they are. For a while, conversions performed by state-sponsored Zionist rabbis under the leadership of Rabbi Haim Druckman were even overturned by the ultra-Orthodox leadership, until Sephardic Chief Rabbi of Israel Shlomo Amar ruled differently. Suffice it to say that in Israel, the topic of conversion is the subject of heated debate: it divides the ultra-Orthodox from the modern Orthodox, and the Orthodox from secular Jews. 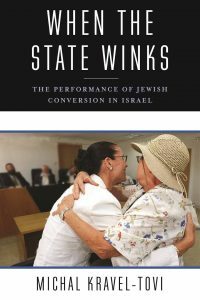 When the State Winks by Michal Kravel-Tovi, a sociocultural anthropologist and an associate professor at Tel Aviv University, analyses the conversion process undertaken by immigrants in Israel, mostly young women from the FSU. Secular, religious and ultra-Orthodox Jews, representatives of the state’s bureaucracy, teachers, and the converts themselves all have pronounced opinions on this process. Kravel-Tovi does not take sides in the highly mediated debate. As an academic, she seeks to understand the policies that inform Israel’s conversion project. She evinces empathy for the converts; but she also identifies with the dilemmas that the bureaucrats and rabbinic judges must negotiate. Typically, academic studies on conversion follow historical, halakhic (religious Jewish legal), psychological or sociological perspectives. By contrast, Kravel-Tovi’s research methodology, focusing on the dynamic interaction between the different parties involved in the process of conversion in Israel, is highly innovative. This approach sheds new light on the complex issue of conversion to Judaism in Israel. Kravel-Tovi begins by describing how the state-sponsored Orthodox conversion process offers a path to becoming Jewish and to being recognized as Jewish by the State and fellow Jewish citizens. In 1999, the Israeli government established a state-authorized conversion school, known by its Hebrew acronym “Mali.” Its role was primarily to support new immigrants from the FSU in their preparations for conversion. The problem was that most of these immigrants were atheists, with no religious inclinations and minimal interest in religious observance. This indifference raised a question for many Israeli Jews: how to structure the belonging of this group of migrants to the Jewish people in a way that maintained the traditional boundaries of Israeli Jewish identity? On the one hand, there was the government’s Zionist policy, which sought to ensure the recognition of as many FSU immigrants as possible as Jewish according to Halakha, while indifferent to matters of actual religious observance. On the other there was the religious Zionist leadership, who led the conversion program, and were committed to the demands of Halakha. The author’s answer is that the objectives of the nation-state are interwoven with the politics of conversion. The State of Israel’s ultimate objective is the inclusion of this group within its Jewish majority population. Conversion candidates need the State to help them become recognized as Jewish; the State, in turn, needs them to convert to Judaism, in order to maintain the Jewish character of Israel. Dramaturgical practices between candidates, teachers and state agents diminish suspicion between the parties, and point to the dialogical and collaborative nature of the different actors involved in the process. The verb “wink” in the title When the State Winks is apt, for it refers to the implicit understanding and collaboration between the subjects and the agents of the state-sponsored conversion process. Rather than reasoning in the binary logic of truth and falsehood, Kravel-Tovi argues that conversion candidates and state bureaucrats exchange messages in a dialogical manner. Following Erving Goffman’s dramaturgical perspective on social interaction, Kravel-Tovi maintains that converts engage in the “performance” of conversion to diminish bureaucratic suspicions. It was Rabbi Dr. Yehuda Brandes, the scholar and educator, who coined the term “wink-wink conversion.” He used it to describe a situation in which the agents and subjects of rabbinic courts exchange “winks” in a process of lying, pretending, and self-deception encouraged by the rabbis. Rather than working with these negative terms, Kravel-Tovi transcends the binary distinction between sincere and false conversion presentations. Instead, she prefers the anthropologist Clifford Geertz’s formulation of “winking”: a performance used to transmit a nuanced message. Thus, she succeeds in offering a descriptive, non-judgmental view of the complex relationship between the different actors. In her view, “winking” implies the existence of an additional meaning; it reflects a partial truth, and is an invitation to collaborate in order to produce a refined meaning. The actors involved in the conversion process are all playing roles, and are doing so in dialogue with each other. By presenting themselves, the potential converts diminish the rabbinic and public suspicion towards them. In Kravel-Tovi’s analysis, converts, teachers, and government officials cooperate in a win-win strategy. Tensions do remain; but there is tacit collaboration between the involved parties enough to ensure the successful conversions that will guarantee the integration of sufficiently credible converts into Israeli society. The dramaturgical perspective on conversion in Israel is Kravel-Tovi’s contribution to the existing literature on conversion. Her ethnographic analysis shows how the actors deploy the “wink” with a view to ensuring the boundaries of the Jewish collective in a biopolitical policy. Israel favors and organizes the conversion of non-Jewish immigrants, and seeks, albeit indirectly, to discourage intermarriage. Kravel-Tovi’s ethnographical study clearly evokes the dynamic, interactive and essential collaboration relationship between all those involved in the conversion process. Following Michel Foucault’s discourse on biopolitics, specifically the State’s involvement in population management and its control over physical and political bodies, Kravel-Tovi succeeds in elucidating a most complex situation. Rather than reasoning in the binary logic of truth and falsehood, Kravel-Tovi argues that conversion candidates and state bureaucrats exchange messages in a dialogical manner. The question of intra-religious plurality, of Reform and Conservative conversions, would make an interesting companion to Kravel-Tovi’s monograph. One area that warrants further research is whether a policy of less demanding halakhic conversions might encourage more people to convert. Another is the concept of “Cultural Jewishness.” These topics are beyond the scope of the present volume. The book explores the subtle, sophisticated cooperation between the various people involved in the Orthodox conversion process. It does not, however, propose an alternative to the present situation. The existing conversion policy in Israel is intended to prevent intermarriage and assimilation, and seeks to successfully integrate immigrants into the Jewish nation. However it does so at the expense of their right to choose how they become part of the Jewish people and start a new chapter in their lives. A final remark about the book: “conversion” is too non-Jewish a concept to depict the situation of candidates and the juridical procedure of the rabbinical court. In a rite of passage, this group of people undergo an identity-shaping integration into the Israeli society. It is a transformation through a learning process, in which the emphasis is placed upon orthopraxis rather than some transformative religious experience. The underlying notion is that one cannot “measure” a soul: but, nevertheless, one may read what Kravel-Tovi calls “legible signs.” Reading these signs, rather than probing a person’s heart and thoughts, permits a “measure” of the sincerity of the candidates at the moment of appearance before the rabbinical court. This is less a “conversion” to a faith than a deed-centered turn in one’s life. This study is well-written and readable. It combines academic professional writing with relevant, informative stories from the field. The result is an informative and beautifully written book. Becoming Jewish: New Jews and Emerging Jewish Communities in a Globalized World, the second book under review, explores the widespread phenomenon of people who feel Jewish and consider themselves as belonging to the Jewish family, but who have not formally converted to Judaism. The volume under review is about crossing thresholds, but also about demarcating the boundaries of the Jewish people. The articles grew out of a research group at the Van Leer Jerusalem Institute under the direction of Netanel Fisher, and a unit at Florida International University in Miami, directed by Tudor Parfitt. Methodologically, the detailed studies comprise sociological, historical and demographic perspectives, political analyses, ethnographic fieldwork, case studies, statistics, and rabbinical definitions. A number of authors in this volume comment on Israel’s need to fill the gap caused by the Shoah, which itself has contributed to a broader conceptualization of the Jewish people. In 1970, an extension to the Israeli Law of Return extended the right to repatriation to any person with one Jewish parent or grandparent, thus bringing many non-Jews with some Jewish ancestry to Israel. Fisher outlines three approaches to the absorption of these non-Jews from the FSU into Israeli society. The first, the secular-national approach, is represented by Israel’s first prime minister, David Ben-Gurion, who was interested in social assimilation. The second is the religious-national approach of former Chief Rabbi of Israel, Rabbi Shlomo Goren, considered “the founding father of national conversion in Israel,” which sought the conversion of these non-Jews according to Halakha. The last, the ultra-Orthodox position, with Rabbi Yosef Shalom Elyashiv its leading proponent, is radically opposed the integration of people it considers not to be Jewish. Ariel Sharon, a secular Zionist and the 11th prime minister of Israel, saw the conversion of these immigrants as a “national mission.” But as mentioned above, only a small number of these FSU migrants completed the conversion process, most preferring the “sociological conversion.” Further, as Arie Haskin writes, many of the converts who do go through a religious process of conversion have social and national motives. Gabriel Hornczyk and Hagit Hacohen Wolf conclude that the expectations among lay people regarding the converts’ Jewish beliefs are higher than their expectations for the converts’ Jewish practice. Significantly, eighty percent of all non-Ethiopian converts in Israel are women. One may surmise that this is so because by changing their status, women are more likely to find a Jewish partner and thus have children who will be recognized as Jewish. A number of the articles in the volume explore the situation in European. After the Shoah, Judaism experienced an unexpected upheaval. Children of Jewish fathers, partners of Jews, and people with religious motivations all converted to Judaism. New Jewish manifestation are present, for example, in San Nicandro and other towns in South Italy. Barbara Steiner notes that in Germany, becoming Jewish has become an attractive alternative for those who feel guilty about their country’s past and seek a new start in life. Susanne Cohen-Weisz explains that in Austria, only Orthodox conversions are recognized; in Germany, on the other hand, there is a free choice between Orthodox and non-Orthodox conversion. Jan Lorenz describes a concerted move to rediscover Jewish roots, and notes that proselytes are a significant group in Poland. Many of the articles in the volume discuss the situation in the United States, where more than fifty percent of the Jewish population are part of interfaith marriages. Several Jewish options exist: Reform, Conservative, Orthodox, Reconstructionist, Renewal and more. Dalia Marx shows how maintaining the fine line between welcoming non-Jews and drawing boundaries touches the kernel and viability of Jewish life in the diaspora. Chen Bram explores attitudes towards Judaism among American messianic groups. Marla Brettschneider claims that the characterization of the US as a land of religious freedom is misleading; people of color, for instance, find it more difficult to receive Jewish recognition and validation. Sylvia Barack Fishman notes that, according to a survey published in 2000-2001, fewer than one out of five non-Jews who married Jews over the last three decades converted to Judaism. She goes on to identify three types of “Jews by choice”: the activist, the accommodating, and the ambivalent. Yaakov Ariel describes how history has shown many degrees of “belonging” to the Jewish people. In Roman times, for instance, there were the God-fearing non-converts who were close to the Jewish people. However, for Ariel, the current approach of American synagogues to attracting new congregants is unprecedented, with many of these congregants possessing hybrid identities. Some of the articles in the book also touch on Jewish movements in Africa. The most well-known of these groups is the Ethiopian Beta Israel, also called the Falashas. Tudor Parfitt contests that the Falashas originate from in the Lost Tribe of Dan, as declared by Chief Sephardic Rabbi Ovadia Yosef in 1973. That the Falash Mora, converts to Christianity, were able to Israel—literally as well as metaphorically—is thanks to Yosef’s successor, Chief Sephardic Rabbi Shlomo Amar, who declared they were from “the seed of Israel.” Other groups, such as Igbo Jewish movements in Nigeria, the House of Israel of Ghana, the Malagasy Jewish Diaspora of Madagascar, the Bet Yeshurun of Cameroon, and the Lemba of southern Africa, all claim descent from ancient Jewish populations. Daniel Lis explains that the people of the Igbo tribe (numbering 20 to 30 million) are further from mainstream Judaism than the Beta Israel. Parfitt explains that the Lemba see themselves as stemming from “the white men who came from Sena,” a view confirmed by DNA research. Nathan Devir shows that the inhabitants of the island of Madagascar have no doubt that they were once Jews. There is also some consideration in the volume of Jewish movements in Asia. Some Chinese, for instance, claim Jewish roots. In his article on Kaifeng Judaism, Noam Urbach argues that sinification conserved local Sino-Judaism. The adoption of ancestral worship, of the patrilineal system and the view of religion as a local, syncretistic sect prevented the total disappearance of this group. Julia Egorova researched the Judaizing groups of the Bene Menashe from Manipur and Mizoram in northeast India, and the Bene Ephraim of Andhra Pradesh in central India. Both groups claim descent from the Lost Tribes. The first group, dissatisfied with their Christianization, looked for pre-Christian traditions to subscribe to in place of the former. Today, they are entitled to immigrate to Israel through conversion. The second group has not, as of yet, attained the same recognition. Galit Shashoua devotes an article to the case of the Bene Menashe, recognized in 2005 by Israeli Chief Sephardic Rabbi Amar as Lost Israelites, “of Jewish seed.” Vivian Hafif Digmi writes on the Indian Bene Israel, who after a titanic struggle are today fully recognized as Jews in Israel, living mostly in Beersheva and Ramla. Millions also claim that they are anousim, the descendants of forced converts to Christianity during the Spanish and Portuguese Inquisitions. Alongside full converts, many retained at least some Jewish customs and laws, whilst abandoning others. Parfitt estimates that between 13.5 and 14 million people presently seek to be considered Jewish or to become Jews. 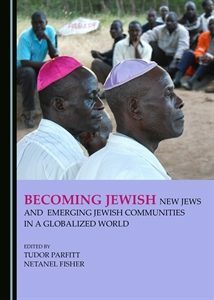 This phenomenon of emerging Jewish communities and Judaizing communities, particularly in Africa, merits the attention of scholars who want to study the global phenomenon of reinventing Judaism—a trend which, according to Shalva Weil, introduces a more intercultural perspective to the age-old question, “Who is a Jew?” But the motivations of those identifying as Jews can be very different. Parfitt argues, for instance, that during the colonial period, Africans in Africa and the Americas often adopted a form of Judaism in order to acquire dignity and improve their status. Between 13.5 and 14 million people presently seek to be considered Jewish or to become Jews. Becoming Jewish invites the reader to celebrate plurality and otherness. Groups who define themselves as Jewish are often not Jewish in the halakhic sense. Imagined Jewish identities exist next to normative Jewish identities. Full conversion is not the only mode of identifying with the Jewish people. As Daniel Lis writes, people with imagined Jewish origins, such as the Beta Israel and—in a different way—the Igbo in Nigeria, are part of the Jewish conversation. Many are affiliated with Jews through marriage, or through intellectual and cultural identification. Regev Ben-David concentrates upon those who live with Jews and are gradually accepted by others as Jews. The ethno-cultural view is an alternative for the ethno-religious approach. Referring to Mordechai Kaplan, Ben-David describes a way of belonging to the Jewish civilization. Such a belonging marks a return to a pre-exilic stage, in which the Israelites as a nation preceded the covenant with the Divine. Becoming Jewish, ultimately, is interested in the millions of people somehow related to the Jewish people and Jewish culture. To contextualize this phenomenon, and to depict and embrace the various ways of living Jewishness in the contemporary world, is the task of the day. The two books reviewed here deal with several ways of belonging, of which full conversion is one option. Entire communities see themselves as Jewish without being formally recognized as such. Various ways of identification are manifest in and outside Israel. To my mind, a larger avenue of inquiry should deal with the issue of exclusivism and inclusivism. While exclusivist thinking contrasts the in-group with the out-group. A more inclusive approach avoids the opposition between “us” and “them”. The creation of a “new we” should recognize and celebrate differences and go beyond them, in bridging and in “trans-different” communication. It seems to me that further reflection is needed on the relationship between unity and particularities. Avoiding the Scylla of an all-absorbing unity and the Charybdis of different groups with no link to each other will be central in the reflection on a “new we.” However, such a broad perspective goes far beyond the description of Israel’s policy towards those who adopt Judaism, and of the real or imagined new Jewish communities in a globalized world. Ephraim Meir is Professor of modern Jewish Philosophy at Bar-Ilan University and the Levinas guest professor at the Academy of World Religions, University of Hamburg. What is the secret of the enduring success of Benjamin Netanyahu, soon to be Israel's longest-serving prime minister? 'Duel Review': What Happened to the Israeli Left? Two reviews, separately written, analyze the factors behind the chronic weakness of the Israeli Left. An interview with Jessica Cohen, who was awarded, together with David Grossman, the 2017 Man Booker International Prize for her translation of his book "A Horse Walks into a Bar." Israel's transition into a global economy is a textbook example of how a country can practice globalization without subscribing to any of its stated values. The Tel Aviv Review of Books is a forum for discussion and debate about books, culture, politics and ideas.